Fourth Row Center: Film Writings by Jason Bailey: On DVD: "Ripped Off: Madoff and the Scamming of America"
On DVD: "Ripped Off: Madoff and the Scamming of America"
In the streamlined (if somewhat simplified) opening of Ripped Off: Madoff and the Scamming of America, it is noted that "he puts a face on what we've all been feeling." It's a succinct and accurate characterization of the man who ran an elaborate, decades-long Ponzi scheme, bilking countless private investors and charities out of an estimated $65 billion dollars. The disclosure of his fraud, in the midst of the worst economic landscape since the Great Depression, grafted the face of a real-life villain onto the greed and excess of the Bush years--it's hard to personify (or even understand) a credit default swap or a NINA loan, but this was a guy that we could point at and say, "Him! Get him!" The History Channel's short documentary examination of the Madoff scandal utilizes interviews with journalists, historians, and victims, in addition to some excellent archival footage (particularly those chilling tapes of Madoff holding court in the late 1990s as a wise elder statesman of the financial world). The special contains some valuable biographical information, not only of Madoff's humble beginnings as a Queens-born stock broker, but of Carlo Ponzi (the namesake of the Ponzi scheme) and other con artists who operated in Madoff's style, though perhaps not to his excess. There's plenty of solid information to be found here--how the lure of the Madoff investment was its exclusivity (he didn't let just anyone throw away their money with him) and it's slow steady performance (one victim notes, quite convincingly, "this was not a get-rich-quick scheme"); the tale of Harry Markopolis, the financial analyst who attempted, for the better part of a decade, to alert the SEC that Madoff was a crook; and the tragic story of Rene-Thierry Magon de la Villehuchet, the hedge fund operator who responded to the news that his fund's $1.4 billion investment with Madoff wasn't worth the paper it was printed on by slashing his wrists in his Manhattan office. The documentary moves a breakneck pace, a flurry of images and definitions and images and soundbites, though for all of the information it contains, it occasionally sacrifices nuance for the sake of a quick pulse. The misfortune of Ripped Off is that it follows Frontline's superior examination of the scandal, The Madoff Affair, into the marketplace; that program was simply stronger, with better access to more people on the inside and a more in-depth analysis of the Madoff story. Taken on its own terms, however, Ripped Off is a solid, if less than spectacular, television documentary program. The History Channel has been kind enough to include an entire bonus documentary (though, to be fair, if we were being asked to pony up twenty clams for just the 47-minute Ripped Off, the title might take on some extra dimension). Crash: The Next Great Depression? examines the causes and consequences of our most recent economic breakdown, all the while comparing and contrasting with the 1929 crash and the ensuing Great Depression. It's a thoughtful, enlightening show with some excellent analysis (in fact, probably a slightly better program than Ripped Off) and an excellent addition to this disc. Ripped Off: Madoff and the Scamming of America is a little thin, and suffers in comparison with other, more in-depth documentaries about the Madoff swindle. But it is still worth seeing, and the DVD's bonus documentary provides additional insight and context for this con man who became the recipient of bile and loathing from across the nation. 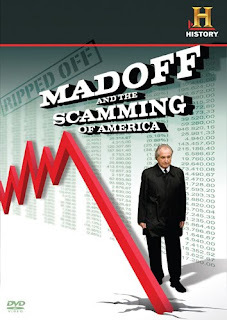 "Ripped Off: Madoff and the Scamming of America" is currently available on DVD. For full A/V details, read this review at DVD Talk. On DVD: "Scrubs: The Complete Eighth Season"